The initials of the ship’s sponsor, Jodi Greene, were welded onto a keel plate that will be permanently affixed to the ship. 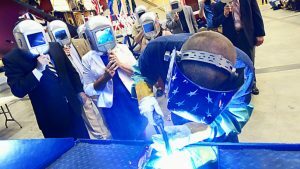 While the keel laying has traditionally represented the formal start of a ship’s construction, advanced modular shipbuilding allows fabrication of the ship to begin months in advance. Today, the keel laying continues to symbolically recognize the joining of the ship’s components and the ceremonial beginning of the ship. This entry was posted in Keel Authentication Ceremonies and tagged keel, uss Minneapolis-St Paul. Bookmark the permalink.